Jesus Christ had been preaching His Gospel for three years around Judea and Galilee and upset the leaders of the Jewish establishment. 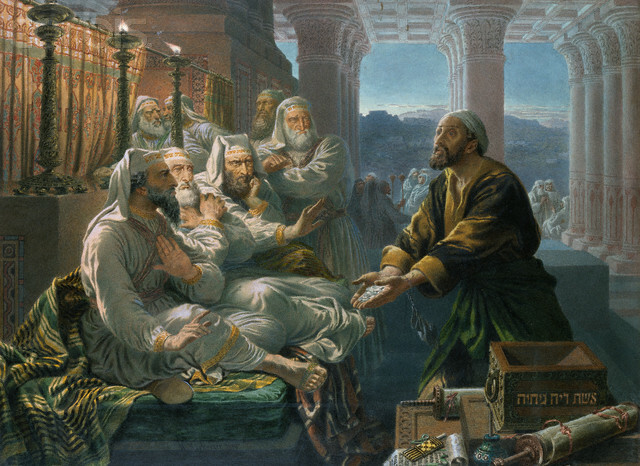 On the Sunday before Passover Jesus made a triumphant entry into Jerusalem and then he went to the Great Temple where he threw out the money changers even though money-changing was legal. Afterwards the supreme court of priests and elders decided that Jesus had to be stopped. Jesus had gathered around Him 12 followers, known as Apostles and one of them, Judas Iscariot, was in charge of the finances. The high priests approached Judas and offered him 30 pieces of silver to betray Jesus. On the night of 6 April 30, the day before Passover, Jesus and His Apostles ate and then prayed in the garden of Gethsemane. Then Judas, Pharisees (adherents to traditional Judaism), high priests and elders approached Jesus and Judas kissed Him. Jesus was arrested and taken to the house of Caiaphas, the high priest, even though this action was illegal on several counts; the Sanhedrin (the supreme court of priests and elders) was not, under Jewish law, allowed to try people at night, during Passover or in a private house. Jesus was accused of blasphemy and high treason (against the authority of Rome). Unfortunately, no witnesses could be found to testify to these crimes. Around 8am the next day Jesus was taken to Pontius Pilate, the governor of Judea who asked, “Are you the King of the Jews?” to which Jesus replied, “You say that I am.” Pilate washed his hands of Jesus, sending Him to Herod Antipas, the ruler of Galilee. However, when Jesus appeared before Herod, He refused to answer any questions and was sent back to Pilate who found no evidence of guilt. Nevertheless, he ordered Jesus to be scourged and then freed. The Jews refused to accept what they saw as a lenient sentence. It was the tradition to free a prisoner during Passover and Pilate gave the crowd a choice —Jesus or the seditious murderer, Barrabas. The crowd called for Barrabas to be freed and Pilate handed Jesus over to the Romans. Jesus was crucified on Friday 7 April 30 at Calvary (which means “place of skulls”) between two thieves. On His cross was pinned a sign that read, “This is Jesus, King of the Jews”. Having witnessed the result of his betrayal, Judas hanged himself. Peter, the Apostle who had denied Jesus three times, became the first pope.